Born: Son of French parents, born in San Andrea da Barbara, Italy, 2 July 1922. Education: Studied architecture, Saint-Etienne, France. 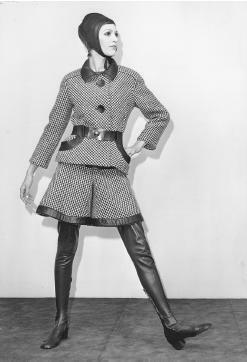 Pierre Cardin, fall/winter 1968 collection. Military: Served in the Red Cross, World War II. Career: Worked as a bookkeeper and tailor's cutter, Vichy, 1936-40; Apprentice, Manby men's tailor, Vichy, 1939; design assistant, working for the Madame Paquin and Elsa Schiaparelli fashion houses, Paris, 1945-46; head of workrooms, Christian Dior fashion house, Paris, 1946-50, began costume designing for films, from 1946; helping to design "New Look" in 1947; founder/director and chief designer, Pierre Cardin fashion house, Paris, from 1950, presented first collection, 1951; opened up market in Japan, 1958; first ready-to-wear collection introduced, 1959; marketed own fabric, Cardine, 1968; children's collection introduced, 1969; created Espace Cardin, 1970; special Atlanta showing, pre-Olympic Games, 1996; launched Orphee, 1998; new cultural center named for Cardin, Saint-Ouen, France, 2000; decided to sell and sought buyer for firm. Exhibitions: Pierre Cardin: Past, Present and Future, Victoria & Albert Museum, London, October-January 1990-91. Awards: Sunday Times International Fashion award (London), 1963; Dé d'Or award, 1977, 1979, 1982; named Chevalier de la Légion d'Honneur, 1983; Fashion Oscar, Paris, 1985; Foundation for Garment and Apparel Advancement award, Tokyo, 1988; named Grand Officer, Order of Merit, Italy, 1988; named Honorary Ambassador to UNESCO, 1991. Address: 82 rue Faubourg Saint-Honoré, 75008 Paris, France. Website: www.pierrecardin.com . 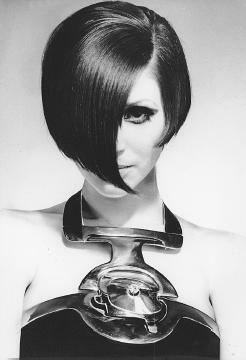 Pierre Cardin, spring 1968 collection: sculpted silver necklace with a $60,000 diamond built into the halter top of a crêpe evening gown. Picken, Mary Brooks, and Dora L. Miller, Dressmakers of France, New York, 1956. Lyman, Ruth, ed., Couture: An Illustrated History of the Great Paris Designers and Their Creations, New York, 1972. Carter, Ernestine, Magic Names of Fashion, London, 1980. Pierre Cardin [exhibition catalogue], Tokyo, 1982. Milbank, Caroline Rennolds, Couture: The Great Designers, New York, 1985. Guillen, Pierre-Yves, and Jacqueline Claude, The Golden Thimble: French Haute Couture, Paris, 1990. Mendes, Valerie, Pierre Cardin: Past, Present, Future, London, 1990, 1991. Morais, Richard, Pierre Cardin: The Man Who Became a Label, London, 1991. Parinaud, A., "Cardin Interviewed," in Arts (Paris), 11 September 1981. Corbett, Patricia, "All About Cardin," in Connoisseur (London), January 1986. Beurdley, Laurence, "Pierre Cardin fête ses quarante ans de création," in L'Officiel (Paris), May 1990. Milbank, Caroline Rennolds, "Pierre Cardin," in Vogue, September 1990. Watt, Judith, "The World According to Pierre Cardin," in The Guardian (London), 24 September 1990. Etherington-Smith, Meredith, "Pierre Pressure," in Correpondent Magazine (London), 30 September 1990. Bowles, Hamish, "Pierre the Great," in Harpers & Queen (London), October 1990. McDowell, Colin, "The Pierre Show," in the Daily Telegraph (London), 6 October 1990. Rambali, Paul, "Pierre Cardin," in Arena (London), November 1990. Niland, Seta, "Cardin Seeks to Widen Profile," in Fashion Weekly (London), 6 June 1991. Pogoda, Dianne M., "Cardin Collection: Coming to America," in Women's Wear Daily, 24 March 1992. "Pierre Cardin Shows Collection in Atlanta," in Women's Wear Daily, 16 July 1996. Raper, Sarah, "Cardin Looks to Future of Firm," in Women's Wear Daily, 17 March 1999. Menkes, Suzy, "Fifty Years a Futurist," in the International Herald Tribune, 18 April 2000. "Pierre Cardin Denies Reports (to Split Up Business)," in Women's Wear Daily, 5 December 2000. The shrewd entrepreneurial skills displayed by Pierre Cardin throughout his career have made him one of the world's wealthiest fashion designers and a household name. A global phenomenon, he was the first designer to open up markets in Japan in 1958, China in 1978, and more recently Russia and Romania, applying the Cardin name to hundreds of products, from ties and alarm clocks to linens and frying pans. Cardin was the first designer to understand the potential of the business of fashion. His move into ready-to-wear in 1959 scandalized the Chambre Syndicale, the monitoring body of haute couture in Paris, and he was expelled from its ranks for what was essentially an attempt to make designer clothes more accessible, and also displaying an astute sense of where the real money to be made in fashion lay. Pierre Cardin, spring 2000 collection. that stands away from the body thereby produces its own structural outline. From the balloon dress of 1959 that delineated the body only at the pull of a drawstring at the hem, through the geometrically blocked shifts of the 1960s to his series of hooped dresses in the 1980s, Cardin obliquely describes the underlying form of the body, creating planes that intersect with, yet somehow remain disconnected from, the body itself. Cardin's embrace of science and technology, together with the notion of progress was expressed in his 1964 Space Age Collection, which featured white knitted catsuits, tabards worn over leggings, tubular dresses, and his growing interest in manmade fibres. He created his own fabric, Cardine, in 1968, a bonded, uncrushable fiber incorporating raised geometric patterns. Cardin's curiously asexual designs for women in the 1960s remained so even when making direct reference to the breast by the use of cones, outlines, cutouts, and molding. Similarly, the exposure of the legs afforded by his minis was desexed by the models wearing thick opaque or patterned tights and thigh-high boots. 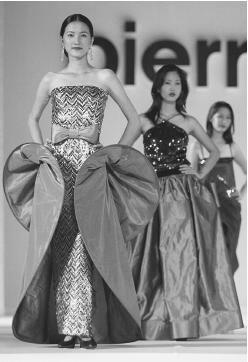 Experiments with the application of paper cutout techniques to fabric with which Cardin was preoccupied in the 1960s were replaced in the 1970s by more fluid materials such as single angora jersey and the techniques of sunray and accordion pleating. A spiraling rather than geometric line began to be more noticeable and Cardin became renowned for his frothy evening dresses of layered, printed chiffon while continuing his experimentation with a series of unusual sleevehead designs. Cardin was the first postwar designer to challenge London's Savile Row in the production of menswear. The high buttoned collarless jackets worn by the Beatles became de rigueur for the fashionable man in the 1960s and provided a relaxed yet elegant look when combined with a turtleneck sweater. Cardin, by paring away collars and relinquishing pockets, broke with tradition to create a new look for men realizing that the male suit, once a bastion of tradition, could be high fashion too. Although merchandising and licensing his name may have overshadowed his influence as a fashion designer in recent years, Cardin's inventiveness and technical flair have often been underestimated. In a speech to American College students in Atlanta in July 1996, he said, "I may design everything from chairs to chocolate, but fashion is still my first love. You may do something classic, something beautiful, but that is just good taste. True talent has a bit of shock element to it; I did black body stockings 30 years ago, and everyone thought they were ugly. Now, they have become classic." Nearing the end of the year 2000, Cardin sought a buyer for his fashion empire. He rejected overtures from French luxury giant LVMH, as well as the Gucci Group, holding out for someone he believed would not only maintain the brand's integrity but would protect his many longtime employees. "I'm not getting any younger," he told Women's Wear Daily (5 December 2000). "I don't have any heirs and I want to assure my company will continue to exist in the future. I don't need to sell; I still get up and work every day. But if I want to insure my employees' job security, I have to start planning for the future."